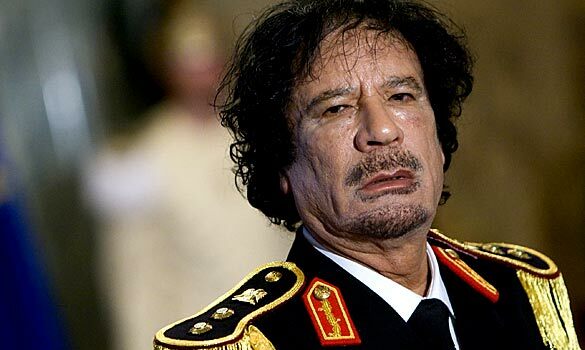 Muammar Gaddafi is dead and buried. 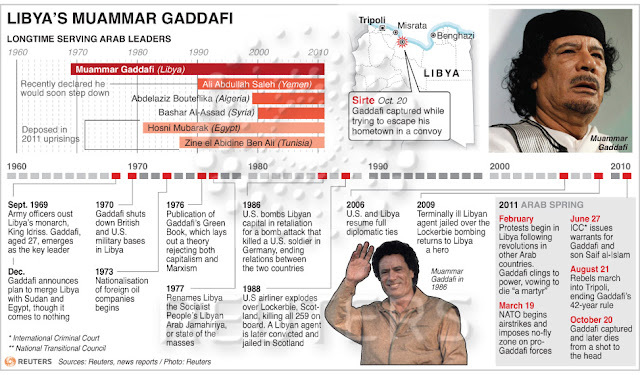 For a man who ruled Libya with an iron fist for nearly 42 years, the end has rather been an ignominious one. From wallowing in his luxury tent to spending his last moments in a drain pipe, Gaddafi's life and death epitomise the adage that 'those who live by the sword die by the sword'. From his hideout, he claimed that he would fight an all-out war, that he was not a woman to run away. This comes from a man who had an all-female bodyguard (Amazonian women guard) who formed the ring of bullet-takers around him. So much for his manhood; did someone say, male chauvinism? He loved women, of course. It was an open secret in Libya that he had the hots for an Ukranian nurse, named Galina Kolotnitskaya. Most of the women guards and nurses would be raped and abused by Gaddafi and his sons and their cronies. 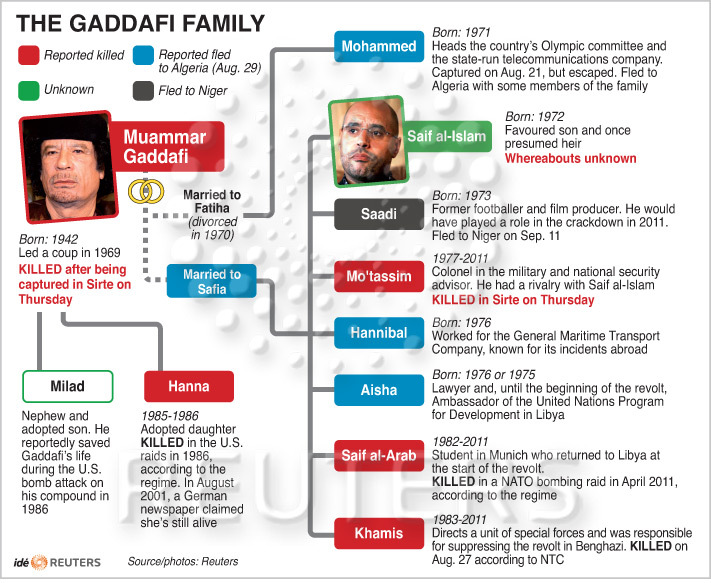 Gaddafi is said to have stashed away U.S.$200 billion in overseas secret accounts and investments. This money was siphoned away from the proceeds generated from Libya's biggest export: petroleum. Incidentally, Libya has the world's tenth largest proven reserves of petroleum. He supported terrorist acts against his enemies, especially against the West, Israel, and Saudi Arabia. The 1988 Lockerbie Pan Am bombing is a case in point: Libyan intelligence agents blew up the London-New York Pan Am flight, killing all 269 passengers on board and 11 others in the village of Lockerbie where the plane debris fell. A few weeks after the rebellion against his tyrannical rule started in the eastern city of Benghazi, he went on air to vent his threats to the rebels. He ranted that he would "how no mercy, no pity. We will come. House by house, room by room...vengeance awaits rats and dogs... It's over. The issue has been decided... We will find you in your closets." Unfortunately for Gaddafi, it was for him the issue had been decided. It was Gaddafi who took refuge in a rat-hole. He died a miserable death, a death of dishonour and shame - much like the way he killed thousands of his countrymen in his paranoid pursuit of power. The Mad Dog has been hunted and killed. Thank you sir. If I may, I have three questions. 1) What is it that led the US to re-establish diplomatic relations with Libya in 2006? Quest for oil? 2) What are the implications of the Arab revolutions for India? 3) Can you share/point me to any book(s) written about the Arab revolutions, apart from this one (http://lynch.foreignpolicy.com/posts/2011/03/07/taking_stock_of_the_arab_revolutions) which you shared with me? now its clear about gaddafi. thanks for the article sir, as per my request. Although he may have brutally crushed the opposition to his rule but he did a lot of good for his countrymen like the Great Man Made River project which brought water to the barren deserts. What will you say about that? Absolutely you are correct. Now only I have got information about gaddafi. Thanks for sharing this information. As students we expect our tutors to give objective view of any event/any person striking a balance between positives and negatives of event/person.Though one aspect can outweigh other,but complete expulsion of either one is uncalled for.This post seems to vent anger over personal loss attached with Gaddifi's regime.